Zubels never fails to deliver 100 percent organic knit plush toys that are as beautifully hand-crafted as they are full of personality. 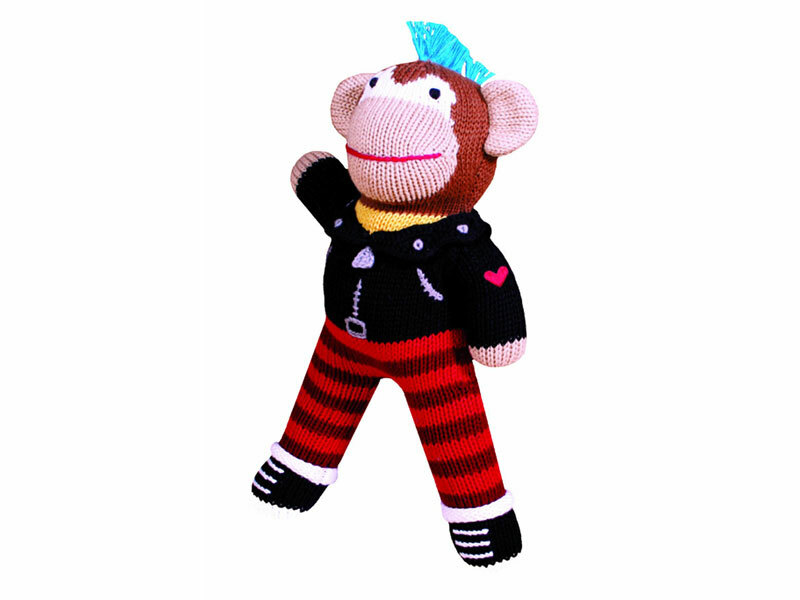 Their latest addition is Ricky Rotten Banana a leather jacket-wearing (faux of course! ), blue mohawk sporting bad boy who’s sure to become your good boy’s new best pal. We think he’s just perfect for rockin’ around the Christmas tree or for your 1-year-old’s birthday bash. If you have a littler rockstar to please, chose a blue or pink guitar rattle. Zubels never fails to deliver 100 percent organic knit plush toys that are as beautifully hand-crafted as they are full of personality. Their latest addition is Ricky Rotten Banana a leather jacket-wearing (faux of course! ), blue mohawk sporting bad boy who's sure to become your good boy's new best pal. We think he's just perfect for rockin' around the Christmas tree or for your 1-year-old's birthday bash. If you have a littler rockstar to please, chose a blue or pink guitar rattle.